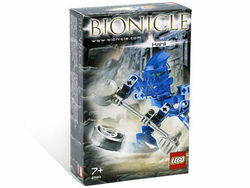 8583 Hahli is a BIONICLE set released in 2003. It was one of the six Matoran released that year. Like the rest of those Matoran, she came with a Kolhii Stick and a Kolhii Ball. This is a description taken from LEGO.com. Please do not modify it. (see an archive of the product's page) Koli champion! Hahli of Ga-Koro never knew she had the potential to be a great athlete - but now she has become a Koli ball champion for her village. Despite this, she is still very shy and quiet. Set includes a koli ball and koli stick. Turning the gear on her back will cause her arms to swing left and right.